Are Schools Getting a Big Enough Bang for Their Education Technology Buck? ■ Students often use technology for basic skills. More than a third of middle school math students regularly used a computer for drill and practice. In contrast, only 24 percent of middle school students regularly used spreadsheets for their math assignments, and just 17 percent regularly used statistical programs in math class. ■ States are not looking at what sorts of outcomes they are getting for their technology spending. The Center did a systematic survey of state department of education Web sites from all 50 states and the District of Columbia and found no evidence that any state had conducted a large-scale technology ROI study. It appears that states instead collect data only on the presence of technology, such as the number of schools with high-speed Internet access. ■ Students from disadvantaged backgrounds are less likely to have access to more rigorous technology opportunities. 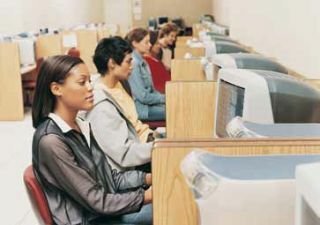 Forty-one percent of eighth-grade math students from high poverty backgrounds, for instance, regularly used computers for drill and practice. In contrast, just 29 percent of middle school students from wealthier backgrounds used the computers for the same purpose.